Little love notes for YKW. I think he'll like getting this note in the morning. Oh, and if he's reading So Wonderful, So Marvelous this fine Friday morning... it was in the cd drive. I sort of found it making a funny noise when I played a cd for like 10 minutes till the noise got louder. Ummm... then I removed it and did a little good juju over the cd drive and all is well. Phew. LOL! I'm glad you found it and you're not going to have to dig through baby poop to recover it. That's a happy Friday bonus. Everyone loves little love notes in the morning, right? They're even better when it means we don't have to scavenge through the one-man-wrecking-crew's poop. Thanks so much for taking the time to add your thoughts! Comments on older posts are moderated, so if they don't get published immediately, don't despair. Sproket hotels and the avian bird flu. How I love thee npr. The summer solstice & take your dog to work day. Goddamnit. And other things not to say. Our cute little Marley lovin' visitor. In the mood for a meme? Got some junk in your trunk? 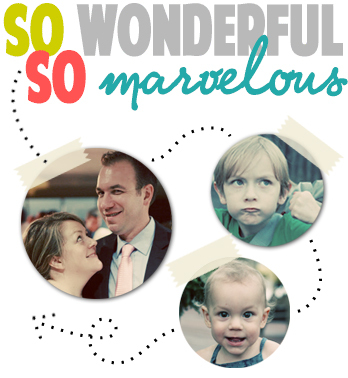 So Wonderful, So Marvelous by Michelle Albright-Peters is licensed under a Creative Commons Attribution-NonCommercial-ShareAlike 3.0 United States License. Based on a work at www.sowonderfulsomarvelous.com.